Shouldn't this site be user-friendly? I used the address, as I suppose it would go to the webmaster (and the site has made it ever more difficult to communicate), to say it was untrue: "But when you click in the comments box, you’re asked to sign in and only after trying to see where did I spot that you had to do it via Facebook. That rules out this ‘anyone’ as I have yet to find a reason to sign up with any ‘social media’ sites. They must gain something by collecting signers’ details, so why is MSE supporting them?" and then "Now I find the same applies to ‘Chancellor writes to lenders’; I have to sign up with something called Disqus." The email address that you entered couldn't be found. Check the address and try resending the message. If the problem continues, please contact your helpdesk. Then, even tho' this is for complaining about a broken link, MSE throws in our face that we won't get a reply giving a working link. It's every bit as bad as banks, govt sites, bbc etc who want our custom but make it as difficult as possible to complain about poor service. What's the point of reporting an apparent error if you won't be told if it's been corrected? Edit: Curioser and curioser. Now, despite two Delivery failed messages because the server couldn't find its own address, I've had an acknowledgement. I have been promised a response. Albeit we did get the leaflet, it went straight in the bin along with all the other referendum leaflets bar one - which was returned to Mr Camecon via FREEPOST, as I considered that I had paid for such a leaflets distribution via my taxes. I did hear the rumours of Mr Lewis quotes being presented without his knowledge, but its nothing new and of no surprise when it comes to policies. if indeed that would really be the case if we left the EU - but regain our sovereignty and judicial independence, to decide how we, the electorate, wish our country to be governed. Is it really possible that you think that 'we, the electorate', by a large majority, could ever force the governing elite, of any 'colour', to dismantle the traditional Britain (or at least England) whose essence, that they so love, lies in its social and economic stratification, with the poverty, unhappiness and poor health, inc of children, and the poor education they obtain? The system they run is designed not to provide an opportunty for that:- you don't have to have studied PPE to read the 'textbooks' that advise letting the people think they have power while making sure they don't. Anthony Eden, in a moment of honesty rare in politicians, told the HoC approvingly (almost a century ago) "We have not got democratic government in this country. We never had it and I venture to suggest ... that we shall never have it. What we have done ... is to broaden the basis of our oligarchy." Isn't that clear enough? ...I have to produce audited accounts that have to be "signed off" by auditors. The EU also have to produce audited accounts each year however it is my understanding that for the past 12 years the auditors have REFUSED to sign off the accounts and thus attest to the accuracy of those accounts. Those auditors have serious misgivings as to the completeness and honesty of the figures. In a nutshell, the accounts have been signed off every year, and the assessment of money paid in and owed by nations typically passes with limited errors. The part which remains stubbornly difficult is where money is paid out, of which about 4% is assessed as being wrongly paid out. Anything over 2% in error for the total budget for any reason triggers the auditors to note that the results are "materially affected by error", which has happened for the last 18 or so years. So far, so worrying. But most of this is due to minor non-fraudulent errors in the complex rules around payment, e.g. the payment was correct, but the process was in error and so technically no money should have been paid according to the accountants. The ECA estimated potential fraud (ie, suspicious enough that they recommended investigating it further) in around 2% of all errors, so somewhere in the region of 0.08% of the total budget. That's still not great, but at this point it's worth noting that about 80% of spending is under direct control of the nation states (ie, the EU has nothing to do with it), so only somewhere in the region of 0.015% of the EU budget is potentially fraudulent and within the remit of the Brussels administration to address. For the EU administration itself to take responsibility for direct action to reduce fraud outside of its direct remit, it would need to step up additional controls over nation states. Including the UK, as we have our own home-grown British-born fraudsters misappropriating EU budget spend, as the Sun and other newspapers have picked up in the past. However, in the interests of balance, I'd also point out many of the cut-and-dried facts in favour of Remain don't stand up to any kind of scrutiny either. 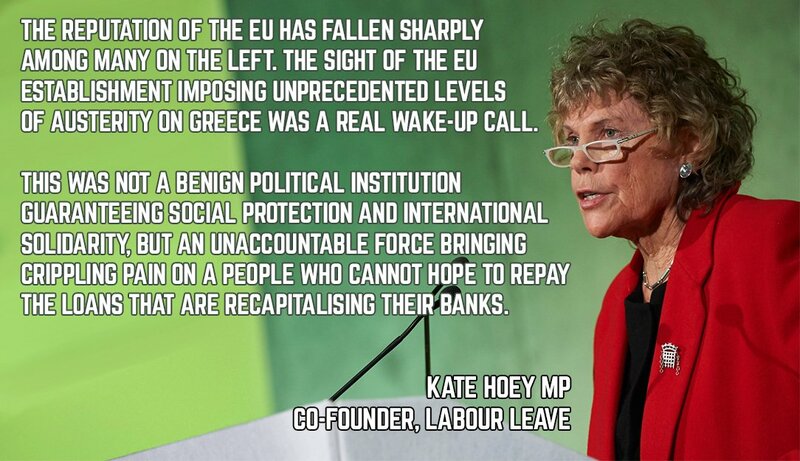 I have no doubt whatsoever that the whole EU Operation is riddled with people lining their pockets at our expense and the sooner we rid ourselves of this festering pit of profligacy the better. Could well be. Completely unlike our own parliament, with it's trifilingly insignificant expenses scandal, of course. Last edited by wozearly; 25-05-2016 at 8:55 PM. I think that's only the case for electing representatives. If it happened in a referendum where the result was expected to be binding, I imagine that while it was bogged down in recounts and legal challenges, Cameron would be rapidly doing some renegotiation in Europe in order to present a new proposal and suggest a second referendum as the first was clearly not going to settle the issue one way or the other. But I absolutely love the image of David Cameron and Boris Johnson sitting and staring intently as a returning officer flips a coin to decide "In" or "Out", with newspapers on tenterhooks as to whether they need to describe the returning officer as a quietly courageous British lion with history's hand on his shoulder, or a meddling busybody probably secretly in the pay of some mandarin in Brussels (depending on which side the coin lands). I would politely ask everyone, leavers or remainers, to do their own research into what the EU is and what it does. Find answers to basic questions: we joined the EEC. Now it's the EU. Why? What does that mean? If you want to leave you should understand what it is that it does that you don't like. In fact the EU does surprisingly little. But it does bring 28 member states together so instead of shouting at each other from a distance about things they may disagree on they have the opportunity to talk face-to-face and iron out their differences. Sometimes this is not possible, and the EU will back away. The EU is not about taking over, it is about encouraging integration. I live in Lancashire; when I go to Yorkshire I find the world (more or less) the same. As I write this I am in deepest Denmark. Funnily enough it looks quite similar here too. Over the decades the EU has not only brought countries together so we can work, rest and play with each other. It has also encouraged non-official links between nations; think of how many towns are twinned; think of the educational links across Europe. These are not part of the EU, but are the benefit of the closer integration of all countries. We all gain. If we come out the first thing that will inevitably happen is we devalue our currency. In other words your wages are worth less. Not in the UK, but as soon as you try to buy anything from abroad it will be more expensive. We can sell more, granted, as our exports will be cheaper; but holidays, for example, will go up in price. Remember, if we leave will things get better? Do you really think so? Just to comment on them, as you clearly haven't. These are some of the luvvies...: what is that post supposed to mean? Rich people want to remain? Boris is rich, but he's not on the list. Yet wasn't it revealed he earned £0.6m last year alone? Don't you think your post was rather selective, or do you think those who will read it are rather stupid? I can't see the point it is making. MPs are a selective bunch: Who'd have guessed it? What is this post saying? Change the voting system? Amen to that. Get rid of first-past-the-post and bring in a more proportional system, rather like the one, perhaps, we use to vote in EU elections. So to be clear, the EU elections are MORE democratic than the UK ones. Interesting. Norway: I can't see the lies told to Norway. There is nothing in the post, so I'll pass on commenting on that. Finally youth unemployment: Yes that is terrible. But if they came out of the eurozone would it be better? Is high unemployment not a feature more of our modern economy with its constant demands for cheaper products and greater automation than the euro? You don't explain why it is so high, so I assume you do not know. Thanks for making these points. All pointless. 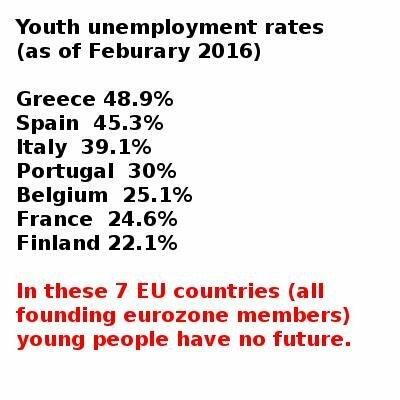 ...and from the same dataset, Germany and the Netherlands, who are also founding Eurozone members, have two of the lowest youth unemployment rates in Europe. The U.K. Isn't too far behind either, for that matter. Germany is also comfortably ahead of Switzerland and Norway (both non-EU members). Meanwhile, South Africa has a worse youth unemployment rate than anyone listed above, and some of the lowest youth unemployment rates in the world are found in Rwanda, Cambodia and Benin. I'm really struggling to see what the youth unemployment figures add to the debate. Yes, it's a blight, but the reasons behind it and solutions to it are a bit more complex than "Are you in the EU or not"
What is the proportion of annual house building in uk compared to the annual number of migrants entering this country? No it means Im not campaigning for either side. I will vote. However campaigning and trying to persuade people to follow my view and making a private decision are very different. As a staunch opponent of the European Union over the decades, Jeremy Corbyn's sudden abandonment of his old viewpoint has shown all the backbone of a jellyfish. Those who signed up temporarily to vote for him in the Labour Party leadership election must be gravely disappointed at the rapid rate that he has abandoned many of his old political positions. The anti- NATO and anti- austerity stances are just two that have also shifted quickly and significantly. 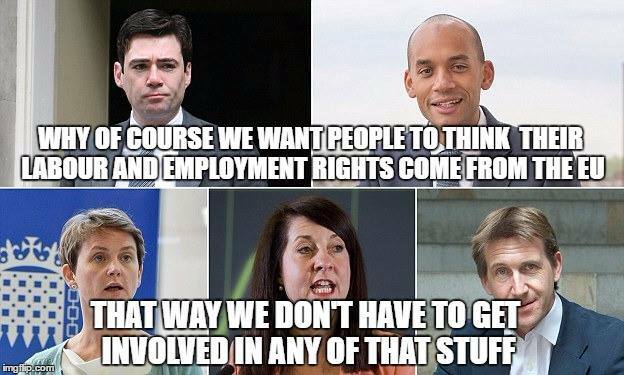 It is absolutely outrageous to mention a bonfire of workers rights if we leave the EU. British workers have seen nothing but a total diminution of their rights since we joined this bosses club back in 1975. Last edited by BernardM; 18-06-2018 at 5:00 PM. A question for you, BernardM. If you wake up the morning after the referendum and find the result it 65% in favour of leaving will you think "Yes! Lots of people agree with me!" and be happy? Or will you think "Hmmm. That's not good. Lots of people have voted for a borderline racist, Little Englander position." and be sad? I understand what you're voting for and why. But it is the effect of that vote that I'm interested in. Archbishop needs to look up Esau. Archbishop needed to look up Esau. A mess of pottage is something immediately attractive but of little value taken foolishly and carelessly in exchange for something more distant and perhaps less tangible but immensely more valuable. The phrase alludes to Esau's sale of his birthright for a meal of lentil stew ("pottage") in Genesis 25:29–34 and connotes shortsightedness and misplaced priorities. Last edited by BernardM; 28-12-2016 at 11:35 PM. Reason: Added the article that was removed with no good explanation. Well I have just had a full page leaflet with Martin's face and a huge bold quote pushed through my door. Martin should have realised that 'any' advice he was going to give was going to be taken massively out of context. If he said 51% to 49% then whoever got the 51% advantage would be pushing his words like he was Saint Paul on the Road to Damascus. Is legal action even an option? They lied to us all in 1975. We have shown the EU adherent politicians what we think of them now! Back in 1975 we were told by the British and European political elite that we were voting on membership of a trading organisation. They didn't tell us that what they really had in mind was a political union or a 'United States of Europe'. They didn't tell us that we would lose the power to make our own laws or that they would form a European Army. They didn't explain the consequences of free movement of labour and capital. They swamped us with false literature whereby they spent nine times more on 'In' propaganda than those of us on the 'left' had available. We now have the opportunity to redress 41 years of living under a lie by telling the liars where to get off! We must all take this opportunity to regain our freedoms and leave this 'gravy train' for the rich which subjects the rest of us to continued austerity. Last edited by BernardM; 02-12-2016 at 7:05 AM. Rule breaking or just a bit of censorship perhaps. Last edited by BernardM; 11-01-2017 at 6:36 PM.